Christmas is just around the corner and we have a free Christmas coupon book printable that allows you to give the gift of thoughtfulness. This is the perfect idea to brighten someone’s day and give to those that seem to already have it all. I know many of you loved my FREE Mom and Dad Christmas coupon book printables, but many of you asked for ones that you could just fill it out for whoever! Well, I am pleased to say that I have that for you today! This is the perfect gift idea for Christmas! A coupon book is just so thoughtful and sure to be a hit. We are really trying to be intentional and even learned how to declutter your home for the holidays. Our goal is to cut down on clutter and give more experiences and less stuff. A Free Christmas coupon book printable is just the perfect thing to provide thoughtful experiences all year long without adding more stuff and clutter to someone’s home. What are free printable Christmas coupons? For those of you that don’t know, a coupon book is simply a book filled with coupons that you have made of thoughtful things that you can do to make that person’s day brighter. The beauty of these coupon booklets is they work for anyone in your life. Just print coupons and you are ready to go! These are PERFECT for you to print out and have your kids fill them out as gifts. Everyone always has fun making these and the recipient loves to get them. It is so much fun to cash in your coupons during the year. A coupon book is truly the gift that keeps on giving all year long! The ideas are endless for free printable Christmas coupons! Make a list of who you want to make coupon booklets for. Next, think of ideas that each person would love. Stay up 1 hour late. Skip chores for the day. I’ll make your favorite dessert. I’ll cook your favorite dinner. 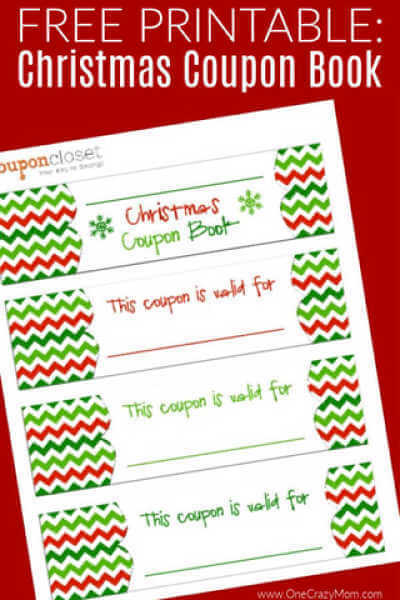 This homemade coupon book template can be customized for anyone on your gift list. They are so fun and really the perfect gift. You can even make kid coupons for parents! Just print out the kid coupon template free pages and let them make a book. 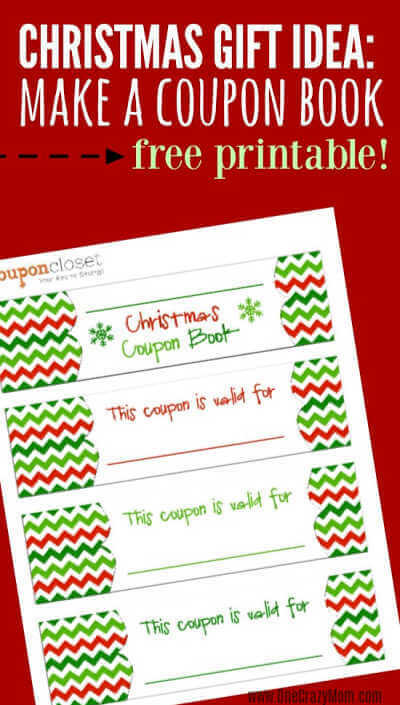 This free Christmas coupon book printable is perfect for everyone on your gift list! I like to use card stock to print the coupons. It holds up better and looks so nice for gift giving. Tie with pretty ribbon and it is so festive! Wrap them up to give, or include them with a gift you have already. 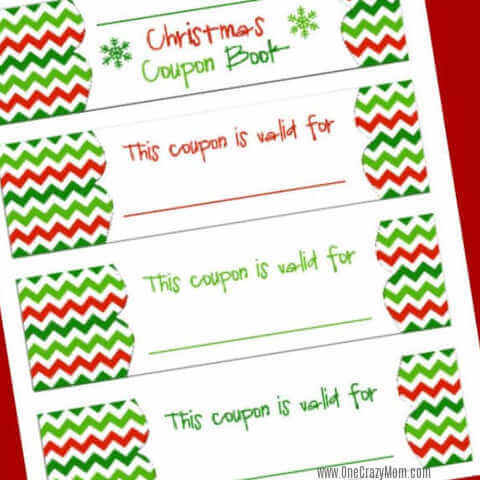 It is so easy to make Homemade Christmas Coupons! We have been doing these coupon booklets the last few years and they are warmly received. Everyone looks forward to getting their very own personal coupon booklet and seeing what is inside. I love seeing the looks on their faces when they read each coupon. But it gets even better, because they get to join in the fun all year long. It is like Christmas for 12 months instead of just one day. This is a great way to put a smile on someone’s face. We always have a really hard time shopping for Grandparents because they seem to have it all and want nothing. They love these coupon books and we put all sorts of fun things on them for them to enjoy year round. I’m sure whatever you decide to do will be great and well received. Let us know how your coupon books turn out. Who will you make Homemade Christmas coupons for? We love making homemade gifts and everyone seems to love them. Not only is it practical and saves money but we know exactly what is going in these products. One idea I plan to do for several people on my list is make them a gift basket with various goodies and tuck a coupon booklet inside. We also love to make Homemade Peppermint Sugar Scrub during Christmas. The red and white scrub looks gorgeous and works so well to soften dry winter skin. I feel much better using these and giving them as gifts knowing what all was used. It is perfect to use at home and also to hand out as gifts. Try making a few new things this year and you will be surprised just how easy it is. Plus, you will have new gift ideas too! Everyone enjoys feeling pampered and a lot of these items get overlooked as people just don’t like to buy for themselves. Yet another reason, they make great gifts! 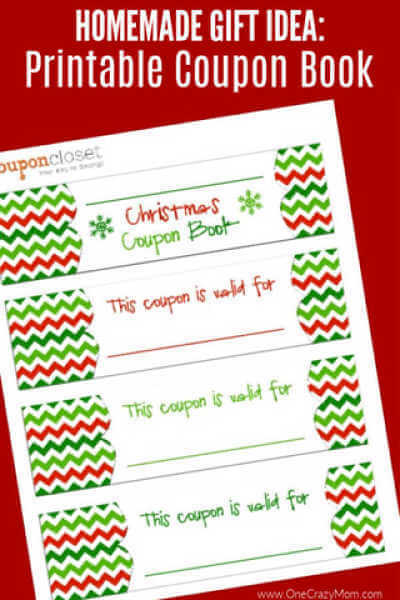 Homemade Christmas coupons are so thoughtful and really special for those people in your life on your Christmas list. Each book can be customized so the gift seems very personal and thoughtful. If you are looking for Hot Chocolate Gift Ideas, learn how to make a Hot Cocoa Ornament that is such a thoughtful and practical gift! Thank you so much! This is perfect for my kids to give my husband! I printed it on shimmery card stock, it came out perfect! Thank you!!! Happy Holidays! This was a great addition to a small gift to make it much more fun!